Now, this may seem like an obvious thing to do if you move to a country where you don’t speak the local language (and no, ordering a burger or asking where the bathroom is does not count), especially if you plan to stay there for a couple of months or more. The real barrier, though, is the cost of learning a language. Well-reputed language schools promise you many grand things – “Speak Spanish like a native in just six weeks! Three months to your dream job as a parasailing instructor in sun-filled Majorca! Looking for love in Spain? Let us teach you the language of loveee!” But they also require you to dig deep into your pockets for the bargain, which most immigrants cannot afford to do. 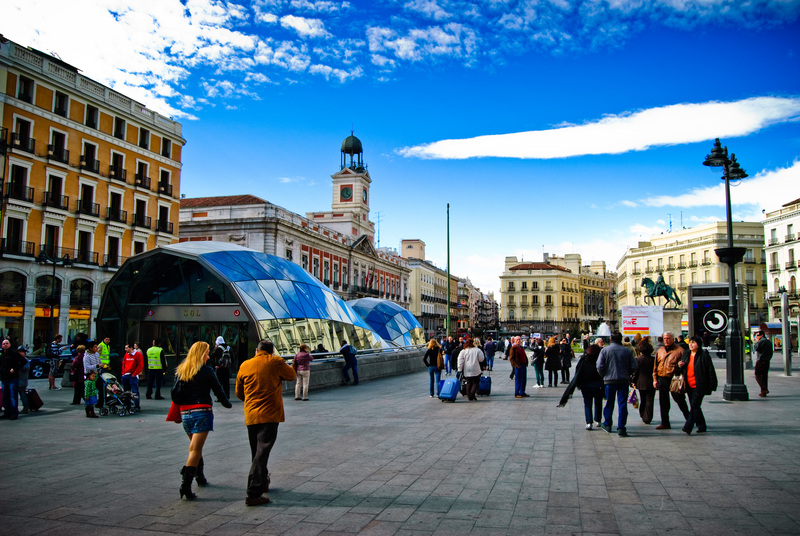 However, thanks to my avid habit of reading advertisements in the metro (and everywhere else), I came across a language school that was reasonably-priced, and only a five-minute walk from where we lived, near Puerta del Sol. Upon investigation, I discovered that C.E.E. Idiomas was indeed a legitimate language school, complete with an administrative office, three stories of classrooms, and plenty of bright-faced, noisy internationals crowding its narrow staircases – and not, as I had initially suspected, some sinister racket for trapping gullible foreigners on shoestring budgets. My first day of class I was terribly excited. I’ve always been a bit of a nerd, and loved going to school as a kid. So, I picked out a crisp new Generation kurti, slipped on my favorite orange flats, tossed a purple notebook and Piano pen into my Democracy Now tote bag, and set off bouncing along to class. I wasn’t only going to learn Spanish. Nobody knew it, but I had other intentions. I was friend-hunting. Unfortunately, my dream of finding a kindred spirit, sitting there waiting for me in the classroom – darkish hair, fairly tall, not unlike myself, whom I would then proceed to hug, and demand, “Where have you been all this time?? ?” – did not quite materialize. None of the students were the right fit. Some were too old (grandmother), some were too young (just out of high school), some had too many responsibilities (committed housewife, mother of two school-goers), and some were just too foreign (Kentucky, USA?). There was only so much we could share or talk about. But still, peeling off my pajamas and going to class everyday in the fresh morning air, interacting with corporal human beings apart from my husband and the Carrefour lady was admittedly very pleasant. Plus, our Spanish teacher was an absolute riot, and we spent most of the hour laughing, though we didn’t understand half of what she said. I was learning quite a lot, too, very useful and practical things (for example, the important distinction between ojo, eye, and ajo, garlic, which I had confused more than once at the grocery store: “Tiene salsa de ojo?” “Do you have eye sauce?”). And – how can I deny it – I loved being back in ‘school’! Read Tip #2, Tip #3, Tip #4, Tip #5, and the introductory post of this series! This entry was posted in Expatriate, Friends, Immigration, Language, Life, Madrid, Spain, Travel and tagged American, C.E.E. Idiomas, Expat, Foreigner, Friends, Immigrant, Language, Madrid, Pakistani, School, Sol, Spain, Spanish, Tips.